Do dogs understand our words? To the extent that canines are able to obey verbal commands, they have the ability to process certain aspects of human language. But associating a word with an action (“fetch! )” doesn’t necessarily mean the animal understands the word. Moreover, we know that dogs rely on other clues in order to respond to commands, whether they’re paraverbal (intonation), or non-verbal (gestures, looks, facial expressions). 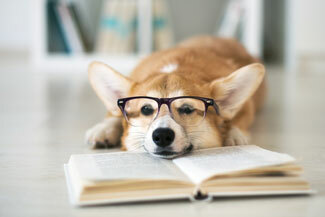 Gregory S. Berns and his colleagues wanted to study the cognitive mechanisms dogs use to distinguish words, and more generally, to identify a word. For the study, 12 dogs (including 3 males) of different breeds (border collie, golden retriever, etc. ), ages 2 to 12, participated in the “hunter protocol” for several months. Their owners taught them to pick up two different items by naming them. The items had different textures: one soft, the other rubbery, in order to help the dogs to distinguish them. When Ninja, Velcro, Zula and Eddie brought back the right objects, they received a food reward or were praised. Each animal was trained at home by its owner (10 minutes per day) for 2 to 6 months and during practice sessions at a dog training center (every 2 weeks). The training was complete once they could systematically distinguish between the 2 objects. Note that all the dogs had previously participated in fMRI studies and were used to the scanner. During the experiment, the trained dog lay in an fMRI scanner while the owner stood at the opening and said the names of the objects at fixed intervals and then showed the dog the corresponding toys. The researchers included pseudo-words in the control condition (for example: prang, zelve, sowt, etc.) and new objects. For example, Velcro might hear his owner say “rhinoceros” or “balloon," and then see him hold up the corresponding toy. The dog might then hear “risnu” and “thozz” and be presented with a stuffed caterpillar or a pillow in the shape of a watermelon. Despite the study's limitations (different breeds, ages, cognitive abilities), the authors say they found neuronal evidence that dogs can detect auditory novelty in human speech. Dogs process this novelty at least to the extent that they can differentiate words they have already heard from totally new ones. This suggests that a dog’s excitement upon hearing the word “rabbit” isn't just a simple Pavlovian reflex, but also the result of a neuronal representation of the word. Still, Berns and his colleagues point out that visual cues are still more effective than verbal ones when communicating with dogs.